When you live in an old stone house you have got to accept that you will not be the only occupant. It’s just a matter of when you meet the other lodgers. As usual I find myself looking into a hole when something starts looking back at me. Unfortunately I didn’t manage to catch the little flickering black tongue that repeatedly tested the air. I was please to see him come out as he will quickly return if he feels any movement. You will note that precaution has won and the last little bit of the tail is still in the hole. Well after that I must have moved and he was off like a shot back into the hole. He does move fast and his speed is what gives him his common name of Western Whipsnake – fast as a whip. We’ve had a couple of sunny days and he likes to sunbathe at the edge of the house. He is well hidden by the bunches of white Alyssum that grow in the cracks, and O.K. the odd bit of chickweed too. Reptiles and Amphibians of France say that they hatch at about 30 centimetres and that was my guess of his length although I am very surprised that they would hatch as big as that. It would mean that my lodger is this year’s hatchling which seems a bit early. 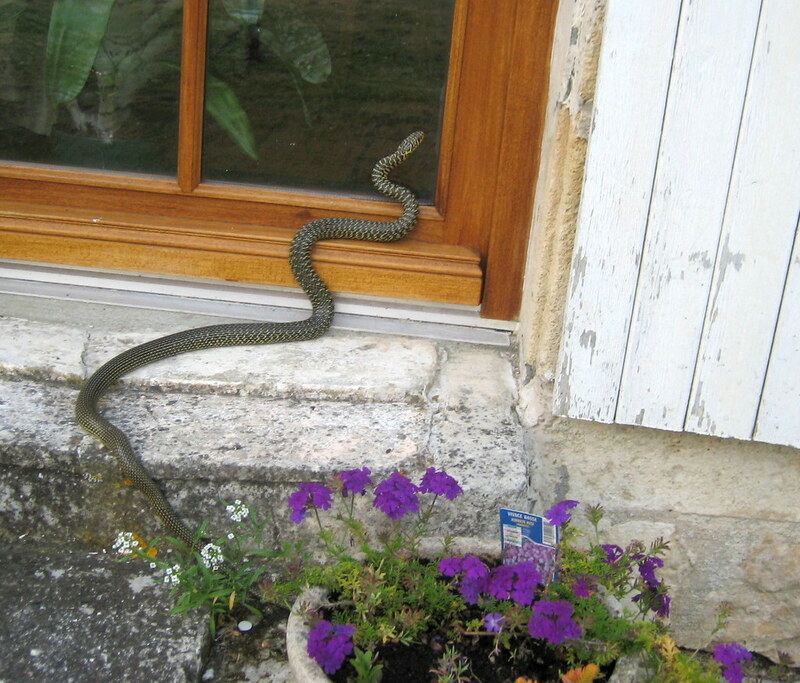 These snakes are common throughout France and we have seen larger ones before (A Snake in the House). 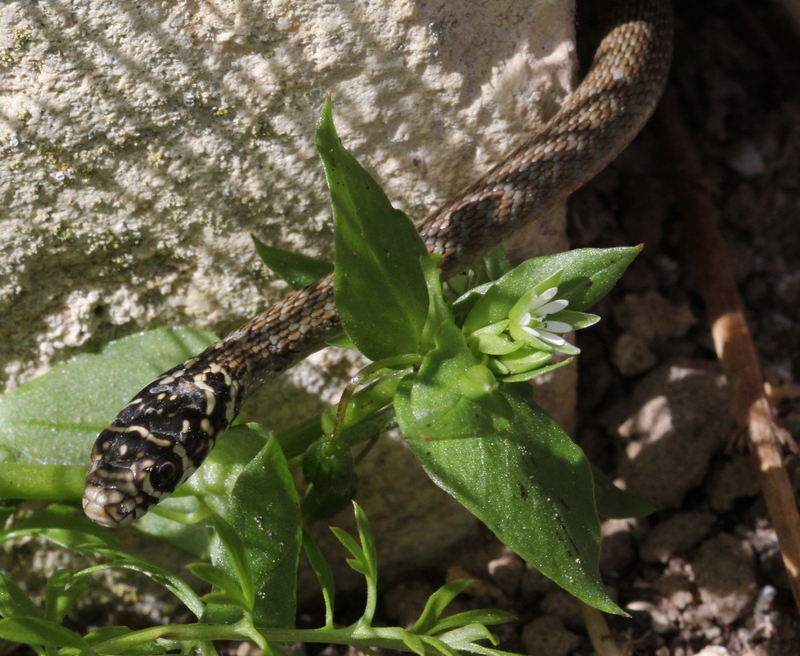 They are not aggressive snakes nor are they venomous so they are very welcome to share the garden with everybody else. 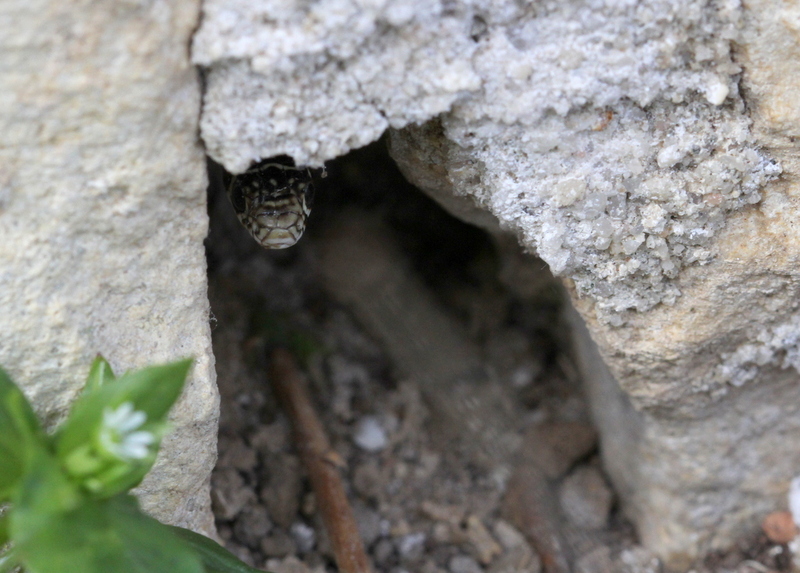 This picture was taken five years ago and the snake made a remarkably rapid retreat mounting the wall vertically and disappearing over the roof. It was a month ago exactly that we had another visitor in almost the same position on the wall. A bat took up residence behind the shutters of the living room window that we leave almost permanently in the open position. 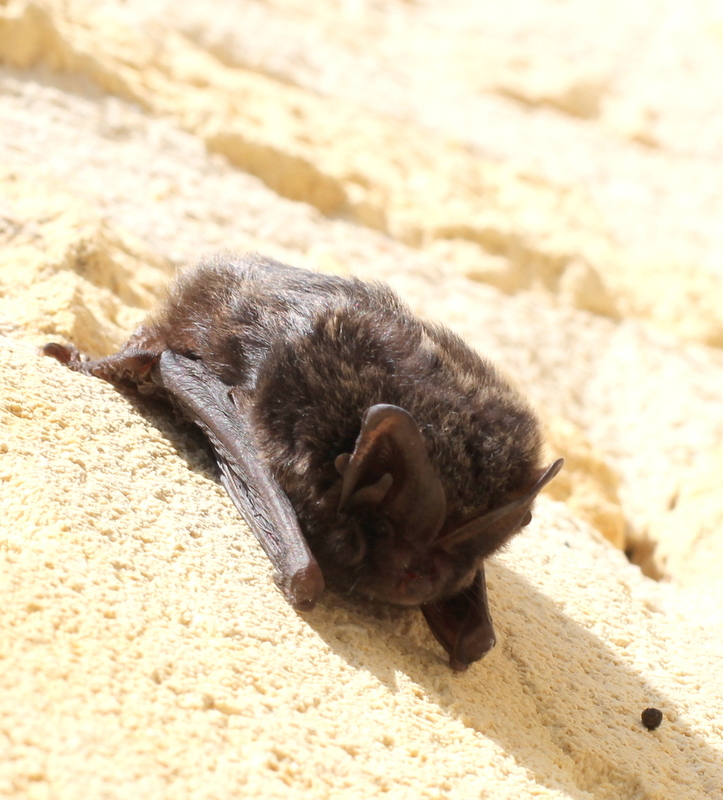 The bat only stayed a couple of nights, probably put off by people taking photographs of him but I don’t really think that behind the shutters would have been a good site for a permanent roost. 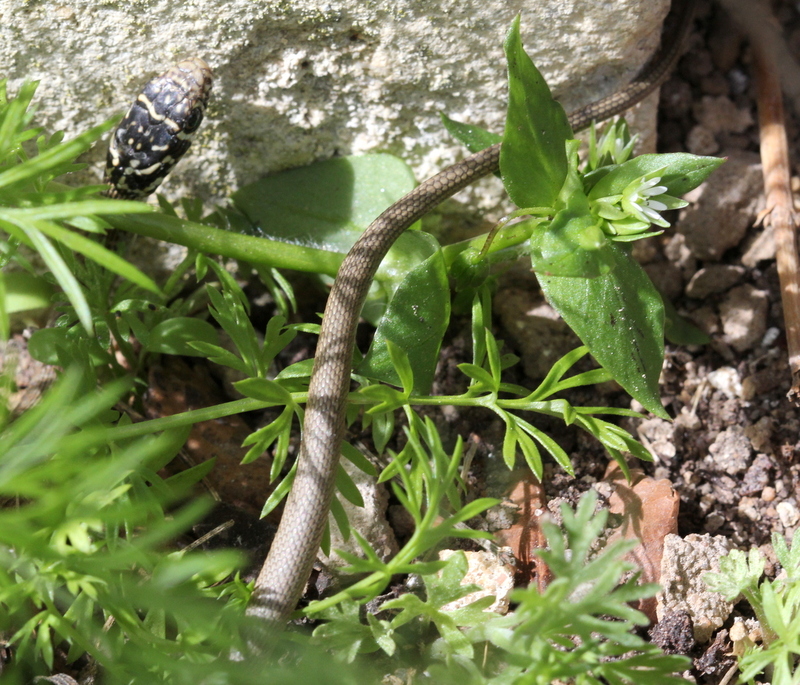 Categories: Nature | Tags: bat, garden, Hierophis viridiflavus, nature, reptiles, Western Whipsnake | Permalink. It is still glacial; I am still drawn towards my warm place near the log fire, watching my frozen garden like a stranger, not quite recognising it as mine. It was -12 C this morning, one degree warmer than yesterday. Should I take this as a good sign? The weather forecast predicts warmer temperatures for next week. Still on the theme of our uninvited visitors, I recall our first encounter just a short while after we had arrived to take up permanent residence here inFrance. It was in the evening and before retiring I decided to make some tea. I rose from the living room and put on the dining room light and froze. A snake was on the floor under my sideboard. Its head was protruding from the one side of the cabinet while its tail was still casually trailing behind and visible from the other end. I did a quick mental calculation – not difficult as I knew my sideboard was 1m30 (4ft 3 ins). The snake was nearly 2 metres long. We had never had any problem with snakes in our apartment in Aberdeen. I quickly pointed out to my husband that we had a 2 metre snake under our sideboard. He got down on his hands and knees to check this out as the reptile had quickly tucked his head and tail beneath the sideboard. He got up and paused to think as I waited for inspiration. “Get that book we have on garden animals”, he suggested. We retired to the living room for further discussion of the usual marital variety while the snake decided to explore, sliding along between floor and wall. My husband was determined that it had to be evicted before we went to bed but the snake was amazingly rapid for something with no legs. He then had the brain wave of hitting the tiles behind him and forcing him to flee from the noise in the direction we wanted. In this way we managed to chase him along the skirting towards the dining room patio doors. Opening the patio doors and banging from both sides we forced him to escape through the open door. He took off across the patio and slid up a stone flower trough. Safe on top of the trough he rose up, hissed viciously and sped off. This was the first noise he had made so he definitely espoused the idea that the better part of valour is discretion. 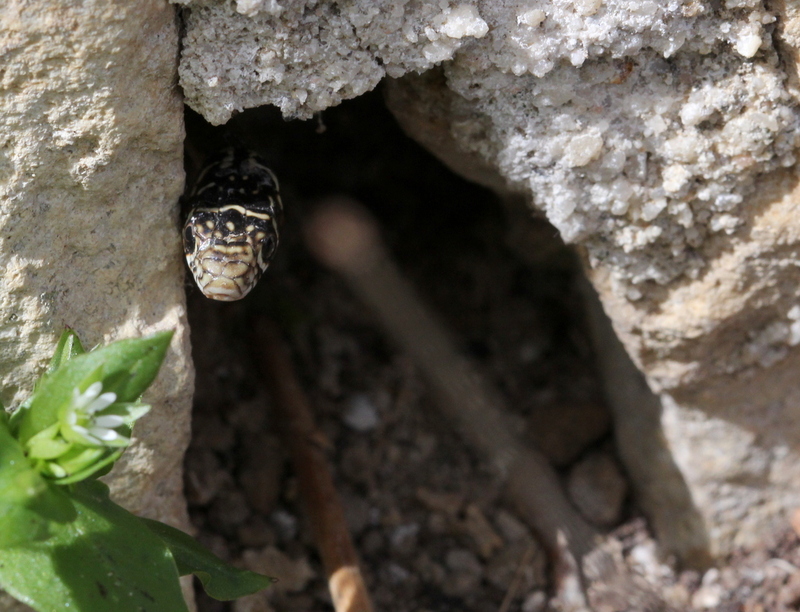 In due course I found an excellent web page in English as well as French http://www.herpfrance.com/reptile/western_whip_snake_hierophis_viridiflavus.php which allowed me to identify our visitor as the Western Whipsnake Hierophis viridiflavus. Unfortunately, snakes are not well loved or understood in this area. 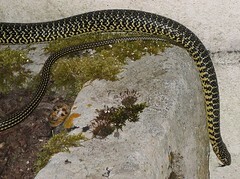 Although most people would identify the snake as a “couleuvre” which is known to be harmless, many would prefer to kill them and ask questions later. Our snake is still with us. We have not had any inside visits again but we see him outside from time to time and he leaves his shed skin in the outbuilding (cellier) to reassure us that he has not deserted us. 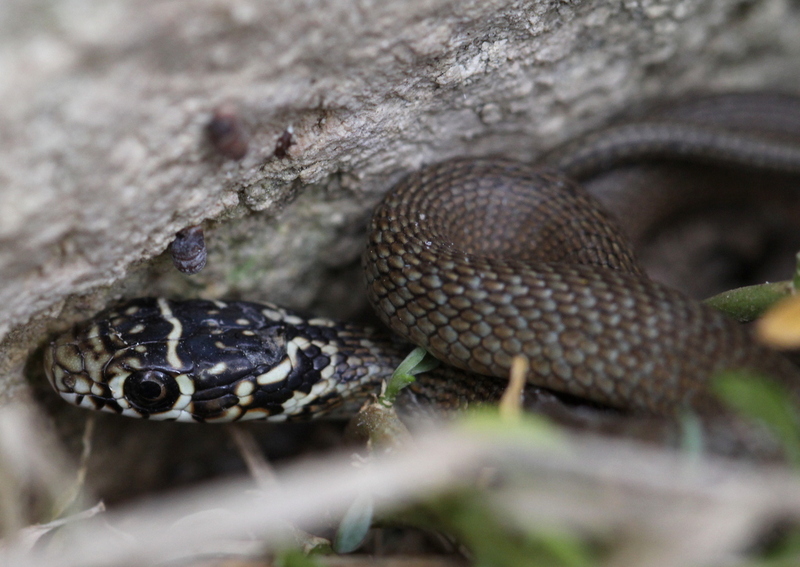 Categories: Wildlife | Tags: couleuvre, Hierophis viridiflavus, Western Whipsnake | Permalink.